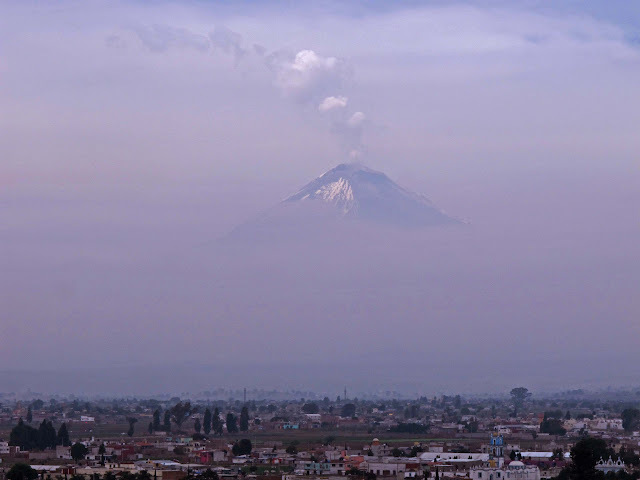 The Valley of Puebla is a plain crossed by a number of small rivers, streams and arroyos, with the most significant being the Atoyac beginning with the runoff of the Iztaccíhuatl and Popocatepetl volcancos. 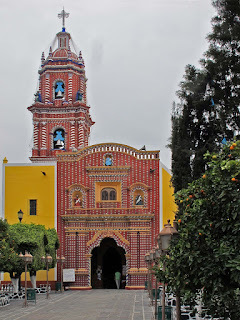 Cholula, located in the river’s upper basin at an altitude of about 2100 meters, is best known for its Great Pyramid, with the Nuestra Señora de los Remedios sanctuary on top and its numerous churches. 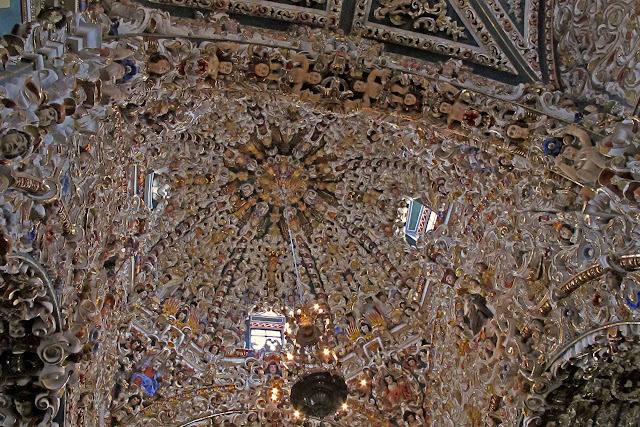 Over the colonial period, forty-seven churches were constructed in the city. At first glance, the pyramid looks like a hill as most of it is overgrown. The south side of the pyramid has been excavated and there is a network of tunnels inside. From the top of the pyramid, in the sanctuary atrium, it is possible to see the Malinche, Popocatepetl, Iztaccíhuatl and Pico de Orizaba Volcanoes in the far eastern horizon. The church was built in 1594 and is home to an image of the Virgin of the Remedies, the patron of Cholula. The first church collapsed in an earthquake in 1854 and was rebuilt, damaged again by an earthquake in 1999 and repaired. The pyramid it is on was a pilgrimage site in pre-Hispanic times, and it remains one now with people coming to visit this Virgin image. According to myth, a giant named Xelhua, after he escaped a flood in the neighboring Valley of Mexico, built the pyramid of adobe bricks. Building of the pyramid began in the pre Classic period and over time was built over six times to its final dimensions of 18 meters tall and 120 meters (390 ft) on a side at the base making it four times the size of the Great Pyramid of Giza and the largest pyramid base in the Americas. In the last state of construction, stairs on the west side led to a temple on top facing Iztaccíhuatl. However, the pyramid had been overgrown for centuries by the time the Spanish arrived. Exploration of the pyramid began in 1931 under architect Ignacio Marquina who dug tunnels to explore the substructures. One other important church of the San Andrés municipality is the church of Santa María Tonantzintla, which is valued for its decoration in what is called folk or indigenous baroque. The church was initially built in the 16th century and developed over four phases until the 19th century. At the end of the 17th century, it had its basic layout, and its intricate stucco work was begun and not completed until early 20th century. These details include pre-Hispanic elements such as dark skinned angels, niches with headdresses, tropical fruits and ears of corn. This area was originally sacred as Tonantzin, the mother goddess, the Spanish replaced her with an image of the Virgin Mary. The name of Cholula comes from the Nahuatl word Cholōllān. 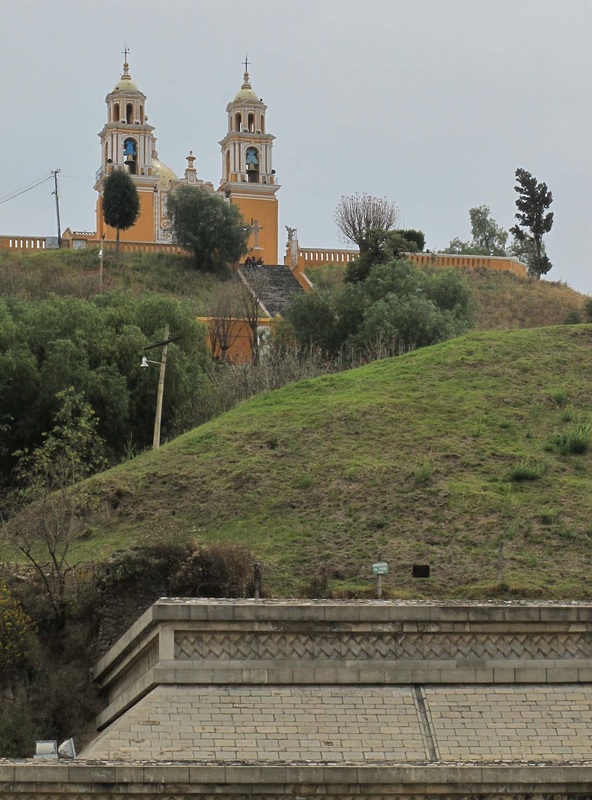 Settlement of Cholula began between about 500 BCE with the establishment of two small villages. At the end of the Pre-classic, many other settlements in the area were abandoned but Cholula grew. This was the time when work on the Great Pyramid began. Cholula continued to grow during the Classic period to a population of about 25,000. In the Post-classic period, Cholula grew to its largest size as a regionally dominant city. The city’s location was strategic, on the trade routes between the Valley of Mexico, the Valley of Oaxaca and the Gulf of Mexico, making it a major mercantile center. A variant of an artistic style and iconography, especially in pottery, spread from Cholula to other areas in the Valley of Mexico, then to other areas in Mesoamerica. This cultural trait is called Mixteca-Puebla was spread by the vast trading networks that existed in Mesoamerica at that time. By the time the Spanish arrived, Cholula was a major religious and mercantile center and one of the most important pilgrimage sites in the central Mexican highlands. Hernán Cortés estimated that the city had 430 temples and a population of over 100,000. Cortés had arrived to Cholula after the Spanish victory of the Tlaxcalans, and he was supposed to meet Moctezuma II here. Since Cholula was allied with the Aztecs, the Spanish and their new Tlaxcalan allies were suspicious of this. 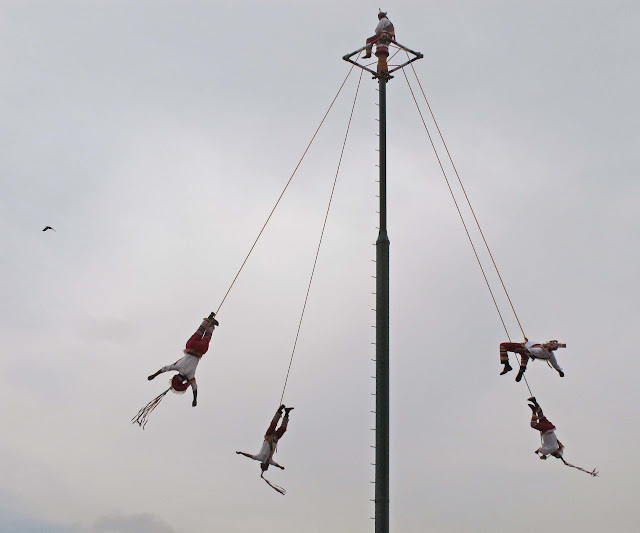 Cortés called the leaders of the city to the central square of the city where the Spanish charged and killed as many as six thousand Chololtecs. The event is called the Cholula Massacre, and it resulted in destruction of much of the city. Unlike many other pre-Hispanic cities, which were abandoned or destroyed before or immediately after the Conquest, Cholula has remained to this day. Nearby in the same valley the Spanish built the city of Puebla, which grew to prominence rapidly. Because of Puebla and an epidemic, which claimed much of its indigenous population, Cholula never recovered its former importance. For more pictures please visit my picasa web album.